A man from Thornaby says he's "over the moon" after the recent heatwave helped him to grow bananas. Sher Khan, 75, and his wife Rozia, 69, have waited 18 years to see fruits finally bloom on their tree. The couple said the bananas started to sprout around two months ago. “We are really proud,” he added. Mr Khan first acquired the tree when it was just a sapling. “We got the tree given by a friend – our next door neighbour,” he said. 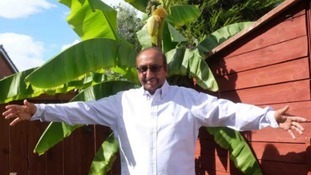 Mr Khan first moved to the UK in 1965 and says he has never seen bananas grow outside in Britain before. Around 20 have appeared and he’s planning a celebration when they ripen. He says the reason the tree has survived this long is because he feeds it with water and eggshells and covers it in the winter to prevent it from freezing.